Green Letter Vision With Globe PowerPoint Templates And PowerPoint Themes Presentations-"Microsoft Powerpoint Templates and Background with green word vision"-Green Letter Vision With Globe PowerPoint Templates And PowerPoint Themes PresentationsThis PPT can be used for presentations relating to-"Green word vision, business, globe, spheres, shapes, metaphor" Feed on the options our Green Letter Vision With Globe PowerPoint Templates And PowerPoint Themes 0912 provide. Adapt them to any style you choose. Instruct your team with our Green Letter Vision With Globe PowerPoint Templates And PowerPoint Themes 0912. Make sure your presentation gets the attention it deserves. Green Text Vision With Globe PowerPoint Templates And PowerPoint Themes 1012-The above template displays a diagram of a green word Vision with 3D globe replacing letter O. This image refers the concept of creativity, solution, technology and imagination. This image has been conceived to enable you to emphatically communicate your ideas in your Business and Global PPT presentations. Create captivating presentations to deliver comparative and weighted arguments.-Green Text Vision With Globe PowerPoint Templates And PowerPoint Themes 1012-This PowerPoint template can be used for presentations relating to-"Green word Vision, Globe, Earth, Technology, Business, Metaphor" Launch products with our Green Text Vision With Globe PowerPoint Templates And PowerPoint Themes 1012. Download without worries with our money back guaranteee. 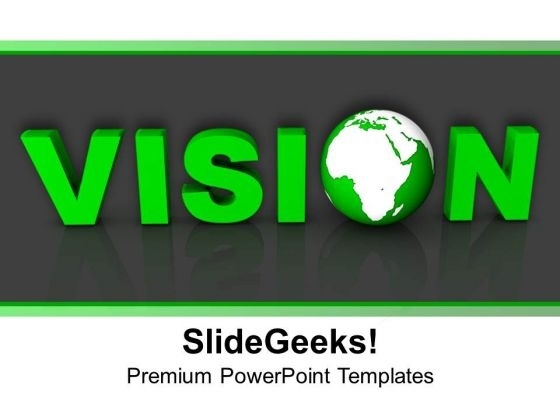 Our Green Text Vision With Globe PowerPoint Templates And PowerPoint Themes 1012 will get their cravings going. Feed their desires with your thoughts.